July 29th will be one year since my life changed. If you would have told me just two years ago that I would be here in Washington D.C., serving at American University Chi Alpha, you would have probably been laughed out of the room! You see, I had a plan. And Chi Alpha, big cities, studio apartment living, and support raising were not a part of that plan! However, God does amazing things, and he has a way of getting you right where he wants you. Two years ago, my wife Brittney and I had just celebrated our two year anniversary. I had just wrapped up my graduate degree, and for the first time in our relationship, neither one of us was in class, or preparing to turn in the next assignment. We were living in Georgia, right down the road from family and friends, involved in a local church, and serving as the makeshift “directors” of their college ministry, which was really just a very small group of 1-5 college students who would meet in our living room every Tuesday night. We loved where we were. Yes, we knew we had both been called to serve the Lord in full-time ministry, but we had not found where that was…yet. Up to this point, we had worked jobs in the marketplace, ones that we enjoyed, but ones that were not totally fulfilling. After graduating from grad school, we decided to start applying for the jobs we would want to be our careers. For a few months we applied to ministry positions wherever we could, to no avail. We even submitted an application to be full-time missionaries overseas, of which we never heard a response back. But God was working things behind the scenes. After a rough season of personal and family loss, I received a tweet from Blane Young at American University Chi Alpha one day in early September: “Hey man, check your email!” That was it. Now, this may seem strange, but Blane and I have known each other now for about ten years. (My senior year of high school, Blane was an intern at the church I found Jesus at in Brunswick, GA.) We kept in touch through college, hung out when we could in person, and even met for a while in a virtual small-group/Bible study through Google Hangouts. Normally, Blane would have texted me to check my email, but getting a tweet was just a little odd. I opened up my email, and in it was a invite to come check out the ministry that he was a part of in Washington D.C. There were two openings in staff the next year, and he wanted Brittney and I to come up and dream about joining the team. 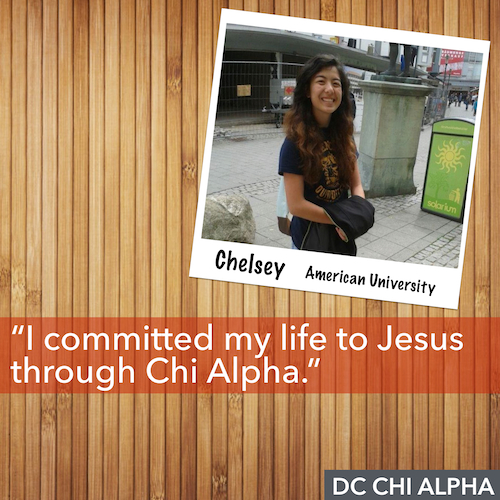 Honestly, Brittney and I had no intention of joining the Chi Alpha team at AU. We were smack in the middle of the roughest season of life either of us had walked through to that point, and we just wanted a vacation. We took Blane up on the offer to travel to DC in October, and a month later we made the 9 1/2 hour drive to the nation’s capital. To say that God grabbed our hearts for college students and for the city of DC while we were there that weekend is an understatement. I vividly remember sitting outside the National Archives Museum with Brittney on the Monday after attending DC Chi Alpha’s Fall Retreat, and just knowing that we would be back. Over the course of three days, God allowed us to dream about the potential in Washington D.C. We would not return to Georgia the same. Over the next few months, Brittney and I would seek God in prayer, seek advice from our mentors and family. In early December, we announced to the students at American University that we would be joining the team in August. For the next six months, we went through the grueling process of building a team of supporters that would back us financially and through prayer as we followed God’s call. At the end of June, last summer, I quit my job with under half of our support raised, and one month to go until the move. Within the next four weeks, God opened up doors like never before and all of our financial support came in. We sold one of our cars, packed up what stuff in our house we didn't sell into a UHAUL, and left small town Georgia for the big city of Washington, D.C. The past year has been challenging. Brittney and I have grown in ways that we could have never foreseen. We have transitioned into full-time ministry and full-time city life. And any day now, we will be welcoming our daughter into the world of ministry in the city with us. We would not have it any other way. God has been so good. 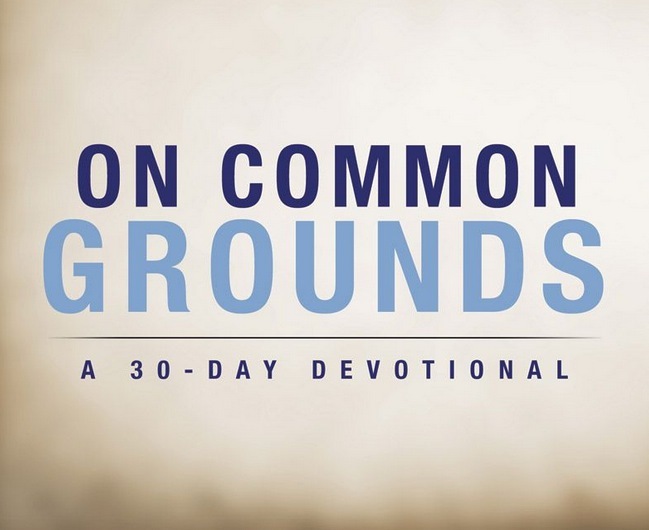 When things seem unlikely to us, we must remember that God specializes in the unlikely. Thank you for letting us serve in the greatest city. 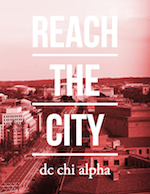 Thanks for letting us be a part of what God is doing through DC Chi Alpha.